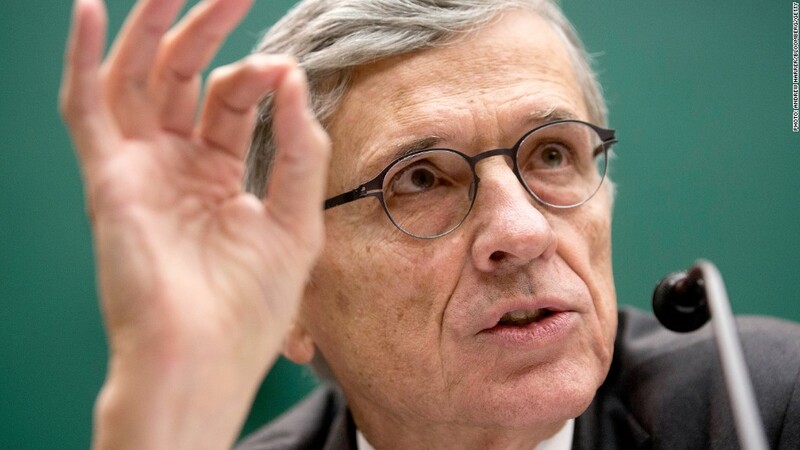 Tom Wheeler says the Internet will be A-OK under his latest regulatory proposal. The Web has been buzzing these past few weeks over news of a federal proposal that would allow the creation of "fast" and "slow" lanes online. As part of the plan, on which the Federal Communications Commission will vote Thursday, Internet service providers like Comcast (CMCSA) and Verizon (VZ) would be able to charge companies like Netflix (NFLX) and Amazon (AMZN) for faster access to customers. 1. Higher costs: Net neutrality proponents worry that if content providers are forced to pay broadband companies more for high-speed delivery, those costs will be passed on to consumers. 2. Slower speeds: Creating fast lanes wouldn't require broadband companies to build any new infrastructure, which means that overall speeds could slow down if certain companies are given more bandwidth in the existing broadband pipe. FCC Commissioner Tom Wheeler has insisted that Internet providers won't be able to punish companies that don't pay for the fast lane by slowing their speeds. But an unintended consequence of giving one company more lanes on a highway is less lanes for the rest of the traffic. And that additional fast lane revenue could create an incentive for broadband providers to allow network congestion to build, forcing companies to pay or face slow service. 3. Prioritized content: If one streaming video company pays for fast lane service but not another, customers will likely gravitate to the one with the clearer picture and doesn't buffer as much. Wheeler has tried to assure the public that the FCC won't allow policies that "divide the Internet between 'haves' and 'have nots.'" But that's already happening. Comcast, which owns NBC Universal, introduced monthly data allotments for broadband customers a few years ago but exempted its own streaming video content, disadvantaging competing services like YouTube. And Start-ups that can't afford to pay for the fast lane would likely be disadvantaged against larger, deep-pocketed rivals. 4. Better service for some applications: FCC officials apparently aren't so worried about the ramifications of a fast lane. In a conference call with reporters last month, they said there are a number of possible instances in which prioritized connections could be helpful to some consumers without harming the broader marketplace, citing the example of remote heart-rate monitoring for medical patients. Brent Skorup, a tech policy researcher at George Mason University's Mercatus Center, says there are a number of other services that consumers would be happy to see given fast-lane treatment. Digital voice service already gets "fast lane" priority on broadband networks so that phone calls aren't disrupted, Skorup wrote in a blog post Monday. Other possible candidates for this treatment are e-learning services, gaming and TV delivered via broadband. Related: Is AT&T going to buy DirecTV? What the fast lane plan won't impact: Notably, the FCC rules won't cover deals like the ones reached earlier this year by Netflix with Comcast and Verizon, in which the online video company (reluctantly) agreed to pay for direct connections to the broadband companies' networks to boost lagging streaming speeds. That's because Wheeler's proposal relates only to what broadband companies do with content in the so-called "last mile" of their networks, where they connect directly to the homes of customers. Comcast and Verizon have effectively set up a fast lane by another name -- the distinction is important for lawyers and regulators, but not so much for regular Internet users. Those deals would continue to happen with or without the passage of the fast lane plan. The fast lane rules also won't cover traffic discrimination on the mobile Web. AT&T (T) moved early this year to institute mobile traffic prioritization, announcing a "sponsored data" plan in which content from paying businesses won't count against customers' monthly data caps. But activists and tech companies see this as a high-stakes fight. Thousands of people have signed online petitions calling for the FCC to abandon the fast-lane plan, while a group of firms including Google and Amazon said last week that it poses "a grave threat to the Internet." All that means the controversy won't be in the rear-view mirror any time soon.